Teacup Thursday #28 and Company! My dear friend LaVonne arrived Tuesday night from Montana. She is a "Harvest Blessing" to me! I usually plan her time here with lots of things to do and lots of people to see. She has really had a difficult summer so we decided we wouldn't over plan her stay this time and just take it day by day, staying close to home. She brought treats for me so wanted to share a few. This is a delicious butterscotch vintage kitchen bowl-the kind I just love. I have never seen one in this color and I will treasure it. This is a close up of a wonderful English biscuit tin. The little lady looks like our Tasha Annabelle dolls. Doesn't this little guy make you smile? He's an egg separator made in Bozeman MT. He'll come in handy and is just so cute. She also brought us ham hocks, spareribs and a chicken from her farm-packed frozen in her suitcase!!! Thanks LaVonne! We went to the Goodwill "bins" today where you pay by the pound. It's one of LaVonne's favorite places to go when she visits me. We spent four hours there and had the best time and found tons of treasures. My husband calls it root hoggin' and that's what we were doing! The hunt is half of the fun. I forgot my camera, but will take some pictures before we unpack the car tomorrow. Of course we had to stop for coffee after that and then on to the craft store. It was almost 7 PM when we got back into the car! I took her to dinner at my favorite Thai food restaurants which was a first and a hit for her. YUMMY. 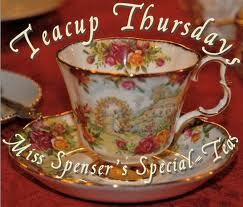 Oh yes...it is time for Miss Spenser's Teacup Thursday! I'm showing another one of my fall teacups. This one is by Ridgefield Potteries LTD and I love the fall pattern. I better get to bed so I can be ready for another day of fun with LaVonne! And belated birthday wishes to sweet Miss Spenser. I hope you had a delightful birthday and my best to you in the coming year. All clean, decorated and ready for company! The house is all clean after the summer avoidance! I always scrub it all down before I decorate and when you have company coming, well, you just have to clean, clean, clean! I do have to admit that I don't enjoy housework like I used to. I guess that's OK considering all the years I've put into that chore. Jim is in Illinois helping his family with his 93 year old mother, so it will just be us girls when my friend arrives tonight. Her flight lands around 6 PM in the Rose City and we will have almost a week to just play and craft our brains out (my friend Nancy's favorite saying). 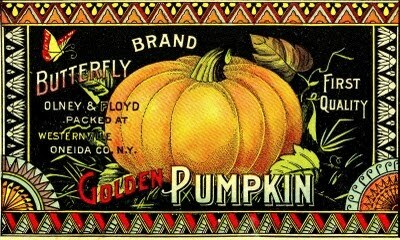 I have to get some groceries and bake us some pumpkin scones. How does a nice cup of hot spiced cider sound? The weather has turned wet and chilly, but the sun will return tomorrow and it looks like some perfect fall days ahead! I love autumn. I have spent the last two days cleaning my home and getting my fall things up. I have a dear friend coming to visit next week, so decided I better get with it! Years ago, I had a friend who introduced me to the whole "tea" thing. We both loved fall so we went on the hunt for fall tea cups. We really had to hunt for them! During that time, we both got into collecting Johnson Brothers's turkey patterns so my interest in the fall tea cups was put aside. I'll feature some of my turkey patterns in November. I was thinking all day about my fall cup and saucers and pulled them down this evening. I haven't looked at them for years. Now that I've joined Miss Spenser's Teacup Thursdays, the treasures are now more interesting to me once again. This one is just so interesting. It's made in Japan, hand painted and called Autumn made by Lefton China. I usually don't like Lefton, but this one is just charming. I love the houses, cows and the people. I do love autumn. The weather has been a bit warm here again but I tried to ignore the 84 degrees and just kept decorating. I get inspired with my quilting in the fall. Here's a few examples of my projects. We arrived home yesterday after a wonderful trip! All in all, the weather was pretty nice and we enjoyed seeing our friend Angie. I'm sorry I didn't get to visit with Clarice, but her girls have chicken pox and poor mom was playing Nurse Nancy all weekend. 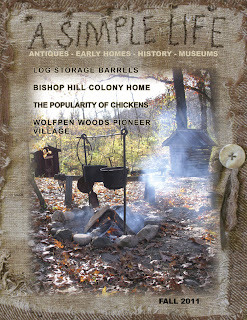 This is a magazine that I so enjoy. My Tasha friend Christine Crocker writes for the magazine and I always look forward to her articles. Jim and I are on another little fall get-a-way in the Olympic Peninsula up north. We left on Friday afternoon and it was such a beautiful fall day. Antiqued our way to Poulsbo and had a great fish and chips dinner outside on the deck! We all know that these days will soon be coming to an end. Saturday morning we drove to one of the farms on the fiber farm tour in Quilcene. Our dear friend Angie Bickerton, was exhibiting her wares at the Taylored Fibers Farm owned and run by Linda and Barry Taylor. This is Barry blending a customer's wool.It had silk in it and was just lovely! Linda was outside selling her beautiful dyed wools...the colors are amazing and you just want to buy it all! And now for the best part~Angie's booth and all of her goodies. She had needled felted dolls and figures along with some awesome wooden peg dolls and other wooden offerings. Of course, Old Saint Nick wanted to come to live at our home and guess what else??? Of course, a doll! I'll have to do a post on her later. She kindly gifted me with a treasure too. Thank you sweet Angie and you know I will treasure that little lady forever. Here's Angie with Old St. Nick who now belongs to the Colantino's! Really cute little guys. This was the funny Slipper Lady Frances! What a riot. Such a fun day! Thanks Angie. Teacup Thursday #26 and Very Good News to Share! I know it's Miss Spenser's Teacup Thrusday, but I have some very good news to share and my head is still in the clouds. Jim and I went to dinner with Gina and Eric on Monday night and they shared with us that they are engaged! They had just returned from a trip to Alaska to meet his mother and family and they found a beautiful vintage ring and well....everything just happened. They won't get married until next October and they will be living in Seattle. Here she is helping me with some computer work showing off that beautiful ring! Gina got a call yesterday for an interview at a community college near Seattle for a teaching position....all very last minute. She had to leave and drive up last night. She has been looking for a job all summer without any results, so this is really an answer to lots of prayers! It's only for one class, but she will be able to get her foot in the door for more work down the road. She was so sad all week as she loves to teach. My head is still spinning. Oh yes, back to Teacup Thursday! I chose a set that Jim picked up for me a few weeks ago as a pair~symbolic of the engaged couple. Really lovely cups, a bit of wear, but still so nice....made in France. I think I'm really too excited to get into Teacup Thursday today. Even my pictures just didn't come out too well. but still wanted to share. So Happy Teacup Thursday my friends. It's been quite a week for our family and I am so thanking God for His many blessings showered on us this week. The weather has cooled down too and maybe fall is on it's way in the Northwest now! 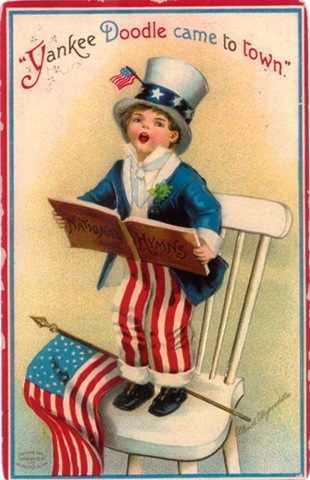 A fun read here....had no idea there was an Uncle Sam Day! I came across this one day on the internet and would love to track down the video collection. My library did have the book, but not the videos. You can view introductions of these on YouTube. They go month by month and are just delightful! 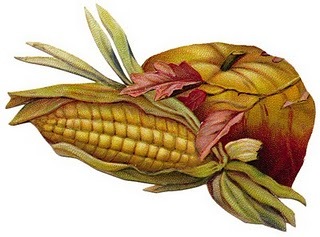 I'm fascinated with Victorian times and have often wondered how on earth they handled their food supplies. Have you ever read the menus for those huge and elegant dinner parties? My goodness. I just picked one of the choices to include with this post. There's several to watch and give you a little look at what this series is all about. Such a wealth of information. I love to watch Upstairs Downstairs....Mrs. Bridges was a wonder in the kitchen. 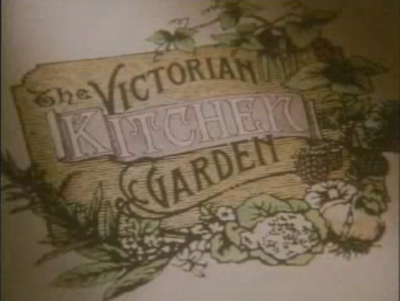 So enjoy and see how things were done in Victorian times~quite amazing! The life of the head gardener must have been something. I thought I'd be featuring a fall teacup today for Miss Spenser's Teacup Thursday, but our summer has come on full blast and it's hard to be thinking of autumn when the temperature is 90 some outside! So, I decided to show you a wonderful sweet "pink" Paragon cup and saucer that I found at an estate sale a few weeks ago for $3 .50. It's a very soft and pale pink and I love the shape of the cup. I was sorting through some magazines and I found this quilting book~Tea Pary Time by Nancy Martin. A perfect name! I had forgotten how wonderful this little book is and I think I need to make something from it! I received a package the other day from my very dear friend LaVonne in Montana. She sent this most wonderful plate as a belated anniversary gift. She found it at a sale while we were on our trip. It's German and just what I have gotten into lately. It's just so pretty and don't you just love the handles? Thanks again LaVonne. I also wanted to congratulate Donna and Spenser on the wonderful article about their tea room in Tea Time magazine. I know some of our group mentioned it last week, but I finally got a copy and it is such a nice story. 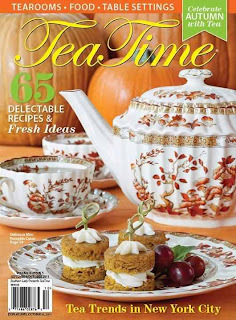 I love the recipes in the magazine-the issue has some lovely fall tea ideas. I'll be keeping this copy. Donna and Spenser have been working so hard and need a big pat on the back! Keep up the good work my friends. The Crossroads Doll and Teddy Bear Show was help on Saturday here in Portland. I really enjoy this one and this September show was the best one I have ever attended. More older dolls and collectibles made it all the better for me! Jim went along, such a good sport,and was also impressed. We've had so many stores and now doing the antique shows through out the year, I think it's fun for him to see how the vendors display their wares! I got to pick out my Christmas present, but it has to be a secret! It will be very fun to share this again in December. A darling wooden peg doll stole my heart. She's not old, but she sure is a sweetie and I love her. I haven't named her yet...maybe Helga...as she reminds me of a sweet little lady who used to bake us coffee brownies with mocha frosting that was to die for!!!! I think she looks kind of OLD WORLD. What do you think? I think she was a good buy at $8. 50. Anyway, she's very happy to be living with the other dollies now in my tearoom. I found this little flyer and loved the graphics. When I got home I was so delighted to find out that it has pages of valuable information about caring for old doll clothes~how to wash them and mend them. A real treasure. 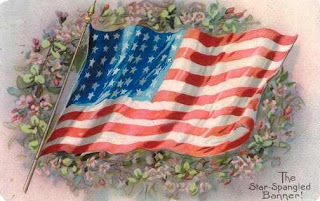 These are a few wonderful paper items that came out of an old scrapbook. I spent about a half hour sorting through a tin of these. I wanted them all, but......at 25¢ each I had was so excited. We found some other great finds, but will share them as I go into fall. It's Labor Day today and our weatherman has promised us some very HOT days ahead...ugh. I thought fall was on the way, but alas, we are getting the summer now that we didn't get in July or August.